The installation of a log burner and flue system into a property with a thatched roof can be a cause for concern for many consumers due to the highly combustible nature of the thatch and sadly, in recent years, the number of chimney related, thatched roof fires have slowly but steadily increased. The presence of thick beds of thatch against a chimney, together with hot flue gas temperatures, which over time will result in the thatch being heated to the point where it will char or burn. This thatch then insulates the brick chimney stack, resulting in the heat being unable to escape and creating a localised hotspot in the centre of the hatch. However, more regulations have been introduced to help reduce (and hopefully stop) these potential dangers from happening. Here is some simple advice to follow when it comes to installing a flue system in a property with a thatched roof, to help keep you and your property safe and compliant with Building Regulations and HETAS guidance. Any work carried out on an appliance or a chimney must be reported to your local authority (this is commonly via the HETAS Compliance Certificate). Before any lining work is carried out, the existing chimney must be swept thoroughly, checked and any corrective repairs must be undertaken to ensure it is in suitable condition. Consult Approved Document J for Building Regulations, ensuring you have reviewed the distance to combustible material to the chimney. What Type of Flue Should I Use? Single brick stack chimneys with thatch tight to the brickwork must have a Twin Wall insulated flue system with a known distance to combustibles (typically 50/60mm) to comply with Regulations. 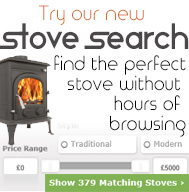 We advise SFL SFlue or Shieldmaster Twin Wall for these applications. Twin Wall systems can simply be assembled and fed carefully into the stack, ensuring it is locked at every joint and secured in the stack, following the manufacturer’s guidelines. You may need to break into the stack to attach the relevant support brackets and ensure the system is central. For chimney stacks with bends and/or offsets, from the point the chimney starts within a living space up to the bedroom ceiling only, this can be relined with a Flexible Flue Liner, cast in-situ concrete lining or breaking into the stack and adding a clay refractory concrete or pumice lining ensuring it is the same diameter as the Twin Wall. These two flues must then be sealed securely. How Large Must the Clearance Be Between my Flue and the Thatch? For small 440mm square two brick stack chimneys, there must be at least a 40mm gap from the outer face of the brickwork to the thatch material, this can be done by constructing a non-combustible shield away from the face of the chimney before re-thatching takes place. They also are unlikely to fit a traditional liner and maintain the required distance to combustibles without adding this 40mm air gap. 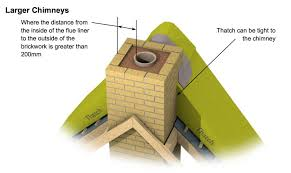 For larger chimneys, where the distance from the inside of the flue liner to the outside of the brickwork is greater than 200mm, the thatch can be tight to the chimney, not requiring the 40mm gap. 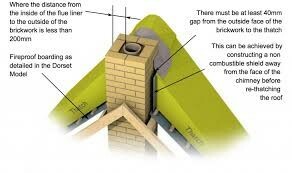 However, it is vital that the flue is fully centred all the way down the chimney. To obtain the required 200mm distance to combustible material on a 6-inch (150mm) diameter lining, the external brickwork of the stack would need to be at least 550mm square and the liner would need to be fully centred. Some local authorities restrict the removal or alteration of the thatch due to conservation requirements, it does make this situation more difficult but is not always impossible to overcome. Back Ventilation can be used to cool the void between the Twin Wall flue and inner brickwork, this preferably should be ducted in from the outside of the building. Depending on the type of systems used, a closure plate and/or support brackets may be required. An air vent between a loft space and the void between the Twin Wall and brickwork should be used, with a high-profile vent in the chimney stack above any thatch to allow back ventilation. It is recommended to install an inspection hatch in the stack, within the loft space so the externals of the System Chimney can be checked during any maintenance inspections on the combustion system. Follow the guide above and it is perfectly safe to install a wood burning stove and flue into your thatched property but please do ensure your home Insurance company is made aware of any plans or installations, failure to do so may result in the home insurance being invalidated.